Your Orlando wedding officiant for the perfect non-religious wedding. Serving Orlando wedding couples, destination weddings, vow renewals and intimate weddings. Notary, Ron Rosenzweig, provides a basic secular wedding ceremony. He offers choices for you to personalize your ceremony to meet your needs. Marriage Counselor, Nelly Venturini, available by appointment. Click the PayPal button below to pay for all your services online with Wed In Orlando. PayPal changed this payment to a "Donation"! It is NOT a donation we use this button for an easy payment method for our clients. Ron will contact you with the payment amount before you make your payment. Hello, and congratulations on your engagement. This is a very busy time in your lives. I would be honored to officiate at your wedding service. I would like to tell you a little about myself. I have a very relaxed demeanor, but more importantly, I am willing to go the extra mile to make your wedding extra special. So, give me a call. I know you will be happy with my services. My background is extensive, having been on the preferred vendor wedding list for Disney Fairy Tale Weddings for more then 10 years. I have also officiated weddings at, The Portofino Bay Resort, The Hard Rock Hotel and Restaurant, Sea World, Leu Gardens, Wyndham Hotels, Cypress Grove Estate House, Bahama Bay Resort and Paradise Cove. 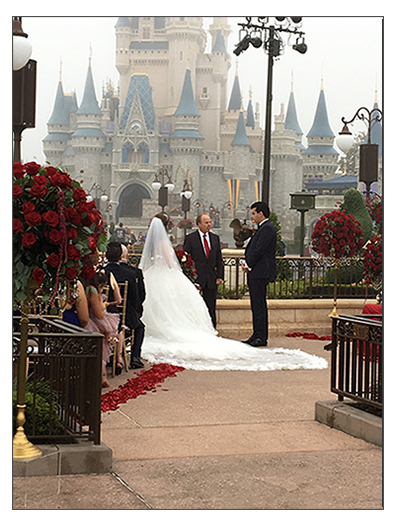 I am Orlando's Notary Wedding Specialist, having officiated more then 3,000 weddings including more then 1,000 for Disney Fairy Tale Weddings since 1999. Included in these numbers are more then 500 for my valued couples from Great Britain. As an expert officiant I will go the extra mile to make your wedding day extra special.